Happy Halloween/Dia De Los Muertos! Hope you all had a fantastic Halloween, and are also taking the time today to remember your departed loved ones (being that it is Dia De Los Muertos). 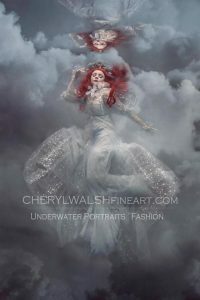 Mather had the pleasure of submerging once again for the incredible Cheryl Walsh, this time donning two outfits representing the dearly departed as well as the passage of space and time. 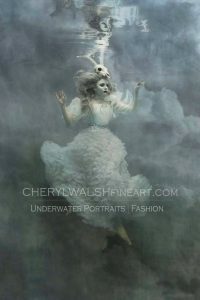 Special thanks to Alta DeKoven for her amazing makeup artistry, and to Cheri Wilson Chagollan for the loan of her beautiful mermaid skirt and neck ruffle to complete the celestial costume. This entry was posted on November 1, 2016. It was filed under Uncategorized.